I've been a reader of book blogs for a couple of years now and have seen Michelle Moran's books on a fair share of them. She's a favorite of many book bloggers and until this week I hadn't read a thing by her. I wondered if she could possibly live up to the hype. Well, my dears, she does. In Cleopatra's Daughter, the reader is introduced to the last living children of Marc Antony and Cleopatra (Kleopatra) just moments before their mother's suicide. Twins Selene and Alexander and little brother Ptolemy have been given to their family's enemy, the emperor Octavian. Now prisoners, the children make the journey to Rome but only the twins survive. The twins fear they will be executed or enslaved at the whim of the emperor. Instead, they are welcomed by Octavia, the kind-hearted sister of Octavian. While Alexander is content to bet on races and enjoy the theatres of Rome, Selene is studious, always planning for the day when she will return to Egypt. The cruelty of the Romans and the treatment of their slaves shocks her. She's not alone; much to Octavian's frustration, The Red Eagle has been freeing slaves and riling up public sympathy. Who is the man- or woman- who no one can catch in the act? Selene's strength and determination appealed to me. At the same time, she still a teenaged girl who does normal teenaged things. She goes shopping and hangs out with her friends. She has crushes and jealousies. She's a lot like any girl except she is a princess banished from her kingdom. Her fate is not in her own hands but in the hands of her enemy. Her life is a precarious one. Still, Selene knows her life could be much worse. She could have been enslaved, sold to the highest bidder, abused by her master until her death. Despite her dangerous position, Selene wishes to make a difference in the lives of the people who cannot speak for themselves. It seems like an impossible task. The brutality of the Romans is hard to read. They seem merciless. Children are disposable, women powerless pawns in political alliances. Romans captured their enemies and enslaved them. Moran describes famous trials involving slaves and slave uprisings. The Red Eagle's heroic deeds appeals to Selene's sense of justice. She wonders if he could be someone close to her. Cleopatra's Daughter is a perfect combination of history and storytelling. Michelle Moran makes Selene come to life on the page. She pieces together what little is known about her life, adds it to what she knows about Rome and images a tale of suffering and triumph. A fairy tale ending fit for a princess. See Michelle Moran's website for more information about this title and others by the author. 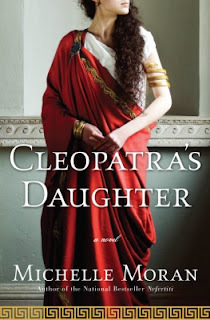 If you'd like a chance at winning a copy of Cleopatra's Daughter, please see my giveaway post. Thanks to Pump Up Your Book Promotion Tours for the review copy. how it affected him as an adult. I'm the first to comment. Does that make me lucky? I loved this book too, and I think you did a better job summing it up in your review than I did. Great review. I'm looking forward to reading this one. Thanks for the review. I can't wait to read this one. Thanks for the review. oooh, glad you liked it, I'm looking forward to reading this! I was already excited to read this one, now I"m even MORE excited after your review!